Welcome back to 12 Months of Wreaths! This is the last month of 12 Months of Wreaths! I have had so much fun participating in this challenge! 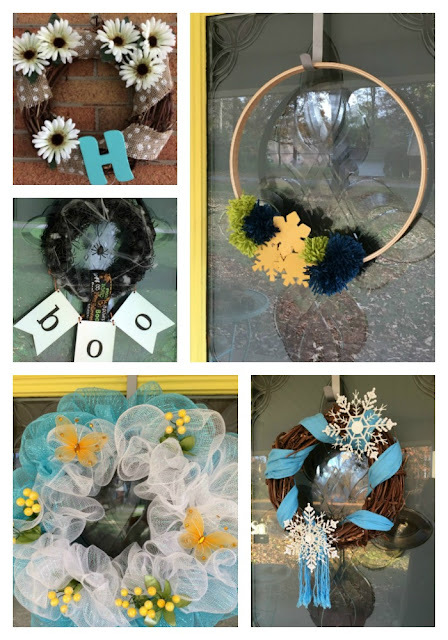 I had been scared to try my hand at making a wreath prior to this challenge, but now I have one for every season! 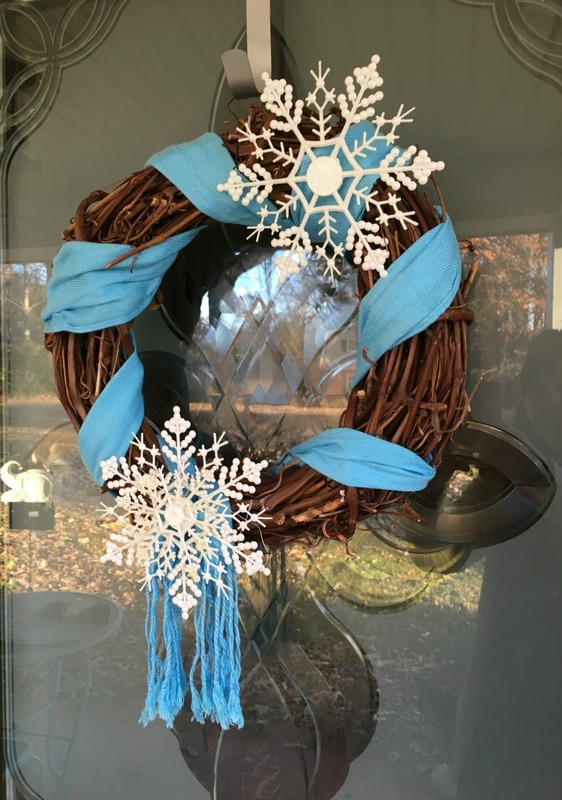 This month I repurposed the grapevine wreath I used in my Summer wreath and made a Winter one. This one was really simple. I folded the scarf in half vertically and starting at the top of the wreath, wrapped it around the wreath until I made it to the bottom. I tied the ends in a loose knot at the bottom. 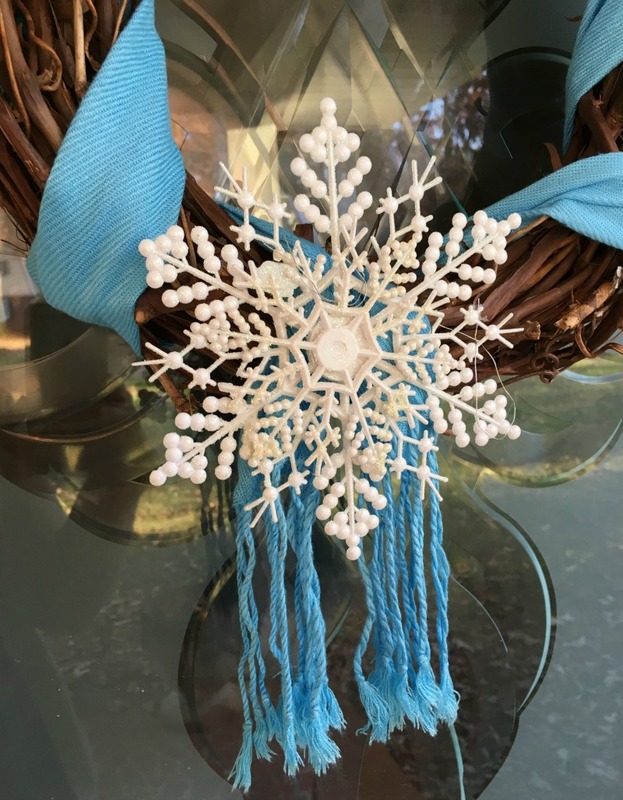 I had two sizes of plastic snowflake ornaments on hand already, that I found at the Dollar Tree a few years back. I used the glue dots to attach one of the smaller snowflakes to the larger one for a layered effect. 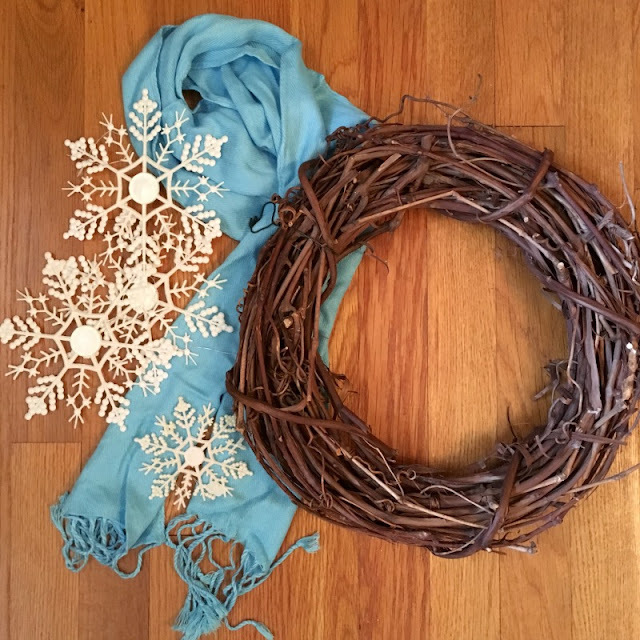 I also used the glue dots to attach the snowflakes to the scarf. Easy peasy!! 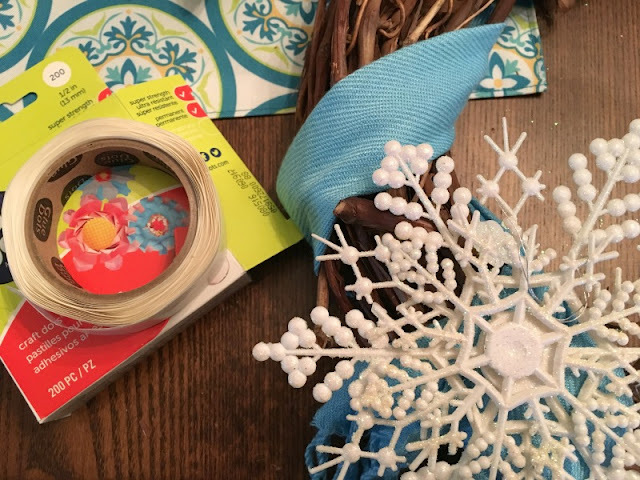 The glue dots are not permanent, so you can easily take it apart and re-use the grapevine wreath for another season like I did. 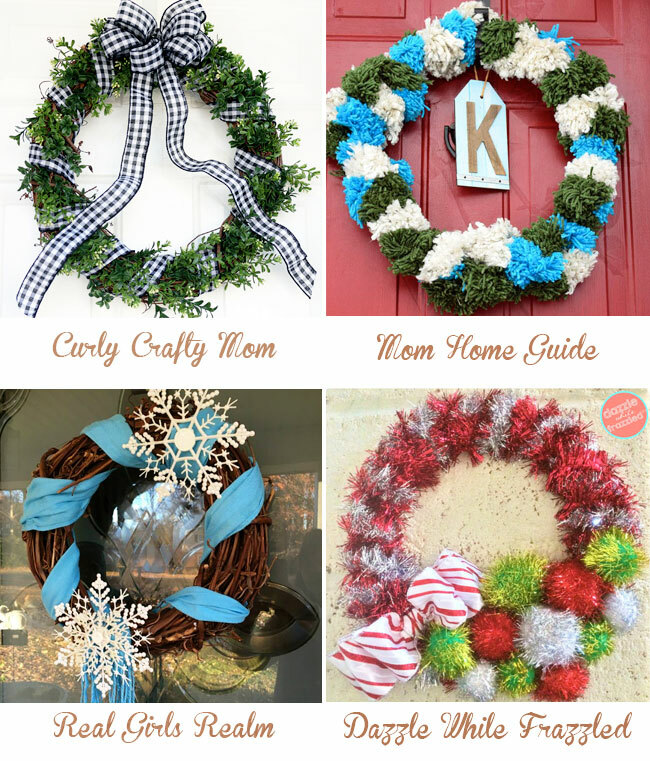 Which of these wreaths was your favorite from this year? Make sure you pin the collage below for inspiration! This turned out really cute, Mary! I have always wanted to try making a wreath with a scarf layered over it. The snowflakes really go well with the color of the scarf! Perfect for winter! Thank you! I had seen the idea on Pinterest and wanted to try it. It was really simple and you can re-use the scarf afterward! 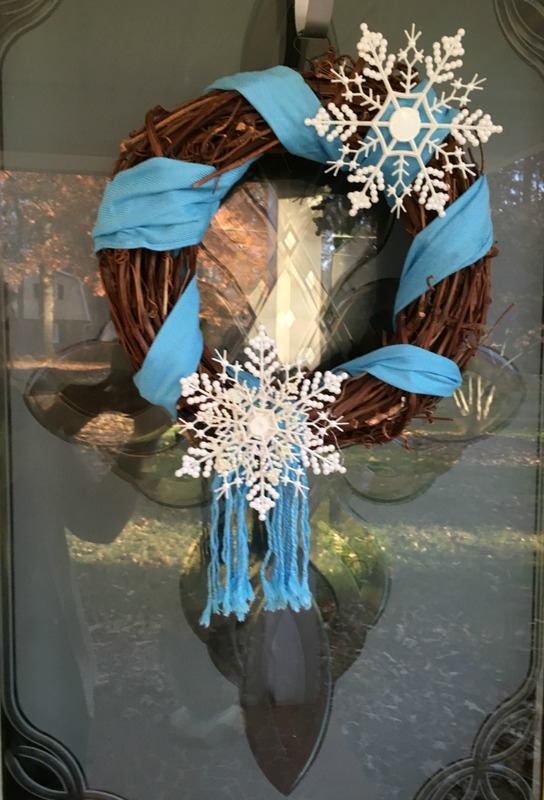 Love your wreath, Mary! I love the blue and the tassels on the scarf! Very nice. Happy holidays and Merry Christmas! Thank you! I just realized you made a similar one using a scarf and snowflakes, when I saw your wreath recap!